The quick run-down of Like You Were Before is that it began in 2005 when Pearson was moving from Toronto to London. Shortly before, she purchased a video camera and shot footage of her friends sending her off. 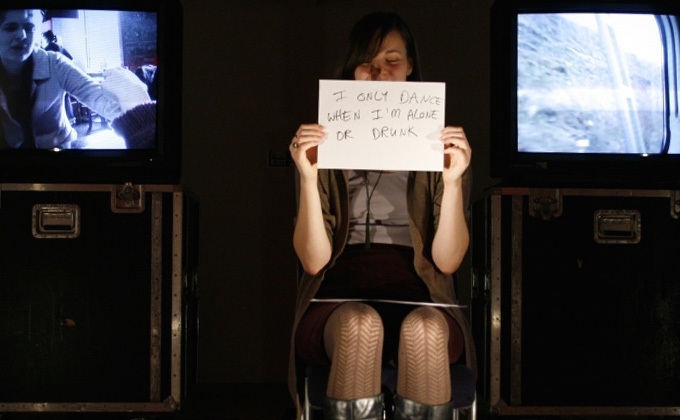 Three years later she discovered the footage, and in 2010 produced the first version of Like You Were Before, exploring the distance between the person she was 2005 and the current. Five years on, she’s revisited it, now examining the person who made the show in 2010 from the same distance as she was from the original video. So basically, it’s a show today about a show from five years ago about a video made five years before that. What all three of these shows explore, then, is some sense of what it means to perform something when the authorship is distanced or alienated from the performance. Jacob Wren turned his songs over to five different bands to realize, through their own style and aesthetic, his songs. Manwatching imposes a deeply lived and felt female experience on a male performer who doesn’t even know what he’s going to have say until he reads it onstage. And Like You Were Before confronts Pearson with being forced to re-enact prior versions of herself, aware that she’s no longer that person (which is basically the theme of the show). Pearson’s work is, in other words, doing much the same thing as Manwatching is: Pearson’s no more “actually” the person she’s performing than the guy doing the anonymous writer’s monologue. Of course what I’m doing in writing this is placing a technique or device above the content of the shows themselves, which risks making it seem like all three are interested in doing the same thing. They’re not, exactly–though it’s also worth pointing out that all three are essentially performances in which the inaccessibility of deeply personal experience is explored through this device. But seen this way, one begins to realize the cynicism of this artistic vision, which is kind of at odds with their presentation. Wren spoke of his project as an act of “gifting” (albeit of songs that, as he put it, “no one wants”), and Pearson’s show is certainly heartfelt, even sentimental (which is almost a bad word in contemporary art, and may explain why the show is so squarely about the failure to completely connect, rather than a celebration of what’s left to her of those prior selves). But even more to the point, I think it gets to what troubled me about Manwatching, which is certainly the most polemical of the three. It’s about how female sexuality is a topic of social discomfort (at best) and actively suppressed (worse), and therefore it employs the cipher of a male performer and his occasional clear discomfort to deliver its message. The thing is, for such a fraught topic it felt like a pretty easy pill to swallow. The audience is indulgent of the performer’s discomfort, and placing female experience on a male body seems to rely on the very inequality the show wishes to challenge. But as it turns out, the night I saw it part of the script was missing from the stage, so there’s a good chance that show somehow resolves this shortcoming. I’m curious what spectators who catch it Friday or Saturday think–I certainly want to see it again if I can swing it.